automatically appear on your screen if you’re viewing the file, with their name next to their cursor so that you can see who is typing. You can also use the live chat functionality to discuss any changes as they are being made. Google Docs can be used to support students in writing group essays because the ‘revision history’ feature allows the contribution of each individual to be clearly seen. 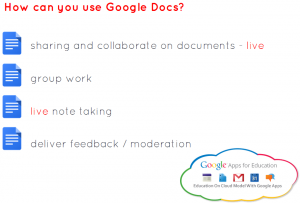 While the Google Drive suite is primarily intended for online use, by using the Google Chrome web browser or the mobile app it is possible to work with documents offline. When working offline, any changes will be automatically uploaded when the device connects to the network. This means that Google Drive is still usable when internet access is intermittent or unavailable, such as on trains and planes. You can see tutorial videos for using Google Drive and Google docs on Lynda.com, an on-line training site that has recently made available to all staff and students at SHU, To access the site go to http://go.shu.ac.uk/lynda and entering your standard SHU login details and search for Google Drive. August 22, 2014 in Resource. Tags: Collaboration, Content, Digital Fluency, General, google apps, Resources, Technology, What_is_a?